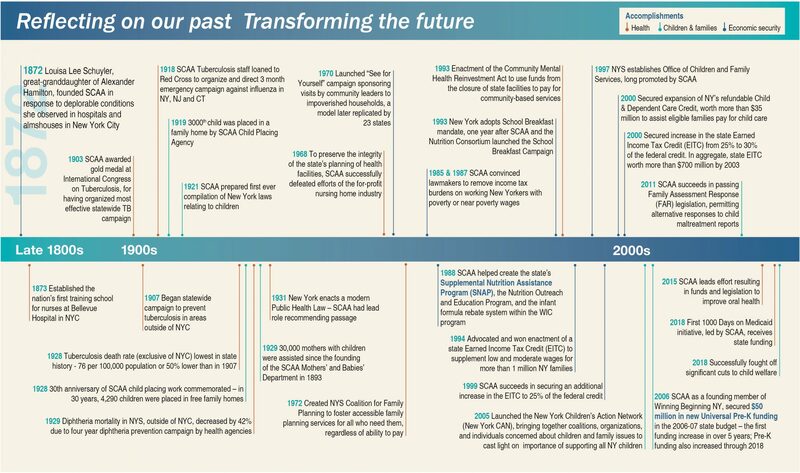 SCAA | Schuyler Center for Analysis and Advocacy – Shaping New York State public policy for people in need since 1872. Children need safe, nurturing and permanent families. The Schuyler Center promotes policies that advance or maintain effective, high-quality systems that serve at-risk families, prevent entry into the child welfare system, and improve child well-being for children who are in care. Seventy-five percent of brain growth and 85% of intellect, personality and social skills develop before age 5—in the first 2,000 days of life—so it is imperative that we invest in our youngest children long before they enter school. The Schuyler Center promotes policies that strengthen and support families, including those that secure or supplement a living wage. Nearly one in four New York children live in poverty; the rate is significantly higher in many New York City neighborhoods and several upstate cities. The Schuyler Center works with government, providers and advocates to improve access to high-quality physical, dental, and behavioral health services. This is for New York’s most disenfranchised residents, particularly related to New York’s implementation of health care reform and redesign of the Medicaid program. Schuyler Center’s Last Look is our assessment of the enacted State budget as it compares to Schuyler Center’s policy priorities. There are 6,709 registered lobbyists in New York State, all working to influence public policy. Our policy team at Schuyler Center is among them, part of a tiny fraction of the lobbying community pressing for public policy benefitting young children living in families facing adversity. The Schuyler Center shares data about the well-being of New York children and the challenges they and their families face. 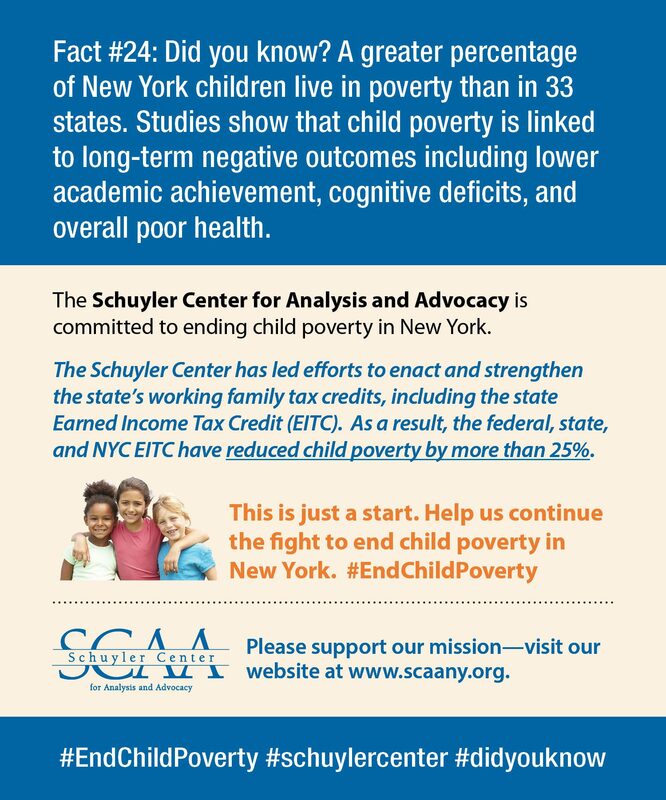 The Schuyler Center for Analysis and Advocacy strives to ensure that New York’s policies benefit everybody, especially children and families living in poverty. We are a statewide, nonprofit, non-partisan, policy analysis and advocacy organization working to shape policies to improve health, welfare and human services for all New Yorkers. We use a data-driven approach to identify problems, generate solutions, and hold government accountable. Studies show that child poverty is linked to long-term negative outcomes including lower academic achievement, cognitive deficits, and overall poor health. The Schuyler Center has led efforts to enact and strengthen the state’s working family tax credits, including the state Earned Income Tax Credit (EITC). As a result, the federal, state, and NYC EITC have reduced child poverty by more than 25%. In New York, each year approximately 71,000 children are involved in indicated reports of abuse and neglect. 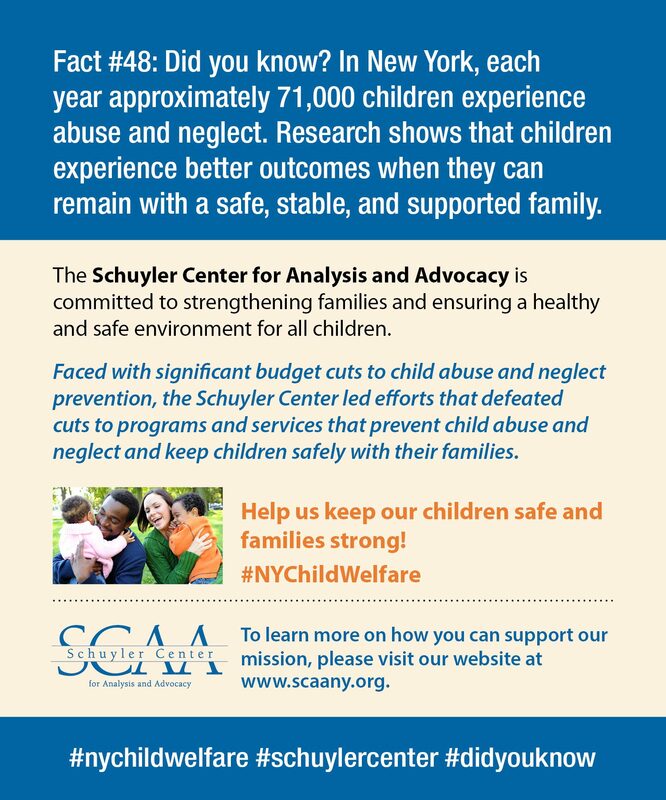 Faced with significant budget cuts to child abuse and neglect prevention, the Schuyler Center led efforts that defeated cuts to programs and services that prevent child abuse and neglect and keep children safely with their families. 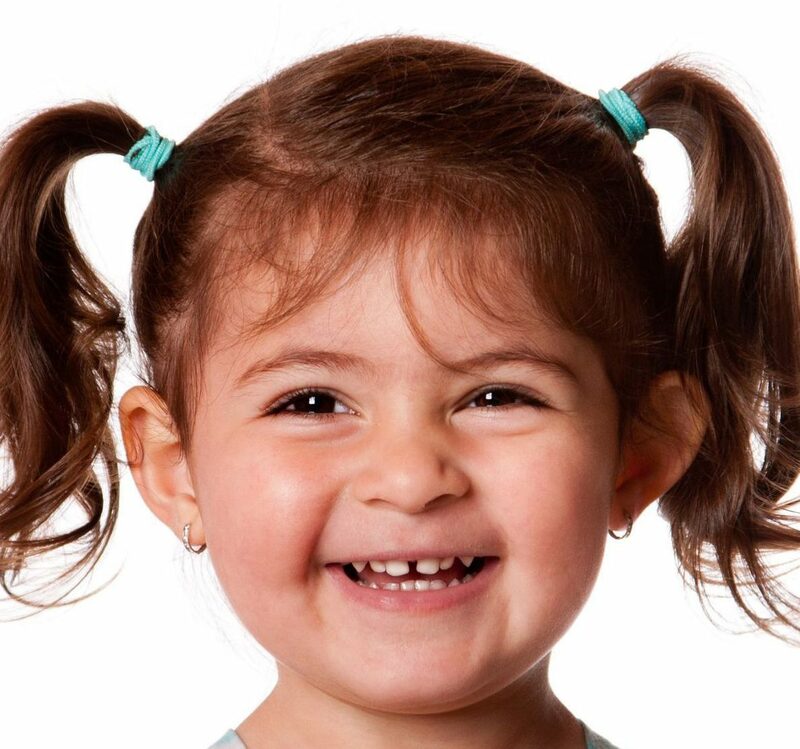 Tooth decay remains the most common chronic childhood disease. This is preventable. 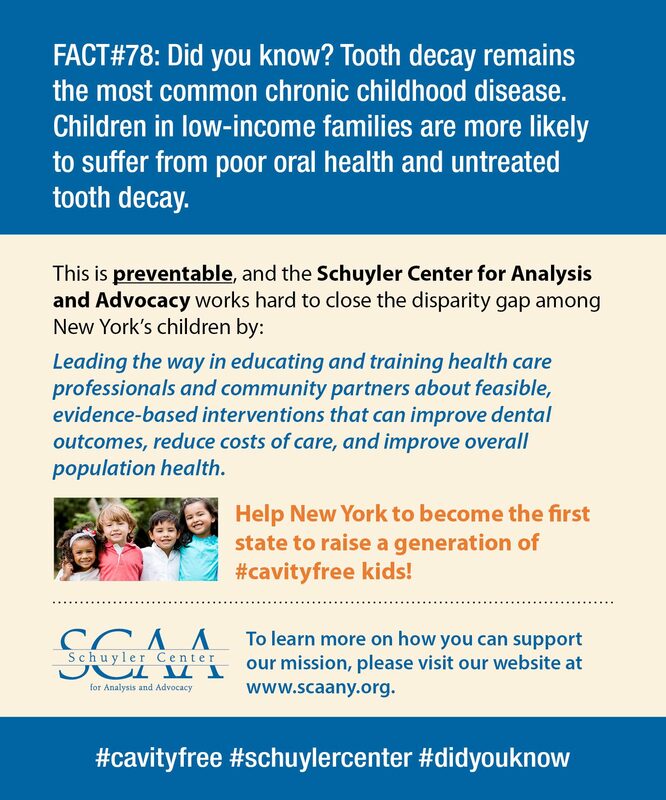 The Schuyler Center leads the way in educating and training health care professionals and community partners about feasible, evidence-based interventions that can improve dental outcomes, reduce costs of care, and improve overall population health.